EVERGREEN - Cooperation partners - Department - Flexible Logistics -Your global transportation partners ! 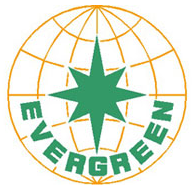 Taiwan's Evergreen Marine Corporation (EMC) was founded in September 1, 1968, was first established, only a two decades-old ship cargo ship hard business development so far, operating a total of about 120 full container vessels, regardless of fleet size or container carrying capacity are among the world's leading position. In 1975, just as the global energy crisis, the sharp drop in the international shipping market, Taiwan's Evergreen Marine Corporation (EMC) of the container fleet expansion plans to new office full container fleet of fast, open up the Far East / East Coast full container regular line, the first precedent full container fleet in China. In 1984, Taiwan's Evergreen Marine Corporation (EMC) has opened up an unprecedented global east-west container regular line, high efficiency automatic container ships, with a good computer information online system connecting Asia, Europe, the United States and three continents the delivery service network, providing the global business community economy, convenience and security of transport services. With the era of rapid change, in response to market demand, Evergreen has the flexibility to adjust business strategy, for example, in 2002, to replace the two pendulum routes run east-west round eighteen years route. Taiwan's Evergreen Marine Corporation (EMC) service network in over 80 countries, up to more than 240 service positions, operated far, near the ocean container shipping route covers five areas globally: Asia - North America routes / Asia - The Caribbean; Asia - Europe routes / Asia - Mediterranean; Europe - US East Coast Atlantic; Asia - Mauritius, South Africa, South America - Australia / Asia; Asian regional routes / Asia - Middle East, the Red Sea / Asia - Indian subcontinent area. In addition to the main routes, but also opened a regional pick barge service network, such as the Caribbean and the Indian subcontinent and other regions, to shorten delivery time to help the owner to grasp business opportunities.